The Vancouver Canucks have delivered relatively good news regarding the health of Alex Edler. 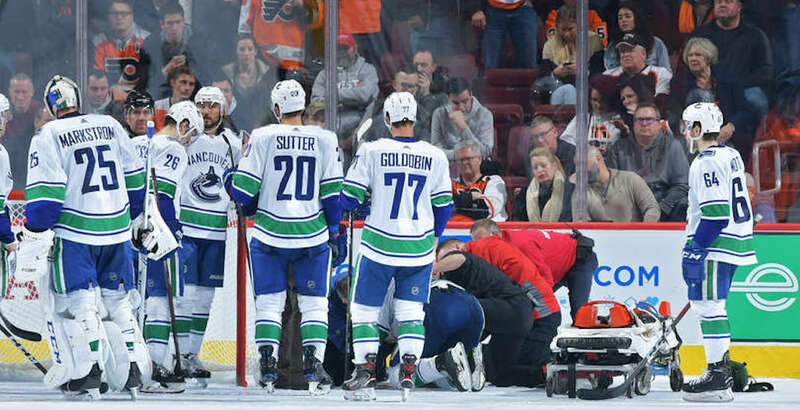 Edler was cut and bruised, but didn’t suffer any broken bones following a scary-looking incident Monday in Philadelphia. As most assumed, he did suffer a concussion, though the team says he’ll be out “at least a week,” which is an indication that the head injury was less severe than originally feared. Edler will be out at least a week with a concussion, said Coach Green. He returned to Vancouver, as did Demko for an MRI. Baertschi is seeing a doctor today in Vancouver. Edler’s stick got caught in Jakub Voracek’s skate during the third period of Monday’s game in Philadelphia, causing the 32-year-old to smack his face on the ice. The Canucks defenceman laid motionless on the ice momentarily and lost a lot of blood, before being carted off. All concussions should be treated seriously, of course, and the timeline can change drastically depending on the player. But if Edler’s injury is indeed only short term, it’s obviously a huge boost for Vancouver’s playoff chances. The Canucks currently sit in the final playoff spot in the Western Conference, two points up on the Colorado Avalanche. Enjoying a resurgent year with 20 points (5-15-20) in 38 games, Edler leads all Canucks players in average ice time (23:24) once again this season and is one of their most important players. Edler will go on injured reserve, with defenceman Guillaume Brisebois being called up from the Utica Comets to take his spot on the roster. Expect Brisebois, 21, to sit out tonight’s game in Washington as the team’s seventh defenceman, while Alex Biega likely draws back in the lineup. Also joining the Canucks in Washington is 19-year-old goaltender Michael DiPietro, who will back up Jacob Markstrom after Thatcher Demko suffered a knee injury in warmup before the Flyers game. DiPietro is an emergency recall from the OHL’s Ottawa 67’s, as the Canucks don’t have another pro goaltender under contract. Sven Baertschi, who missed Monday’s game with a mysterious ailment, is seeing a doctor in Vancouver, the team said.